DES MOINES – The Iowa Barnstormers today announced the team will launch a weekly, Sunday night television program on central Iowa’s ABC-affiliate, ABC-5 (WOI-DT). Beginning on Sunday, April 18, the thirty minute “Barnstormers Red Zone” will air at 10:35 p.m. following ABC-5’s 10 p.m. evening newscast. Barnstormers Red Zone will air every Sunday night through the end of the 2010 season. 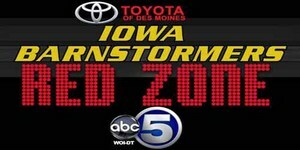 The Barnstormers and ABC-5 also announced that Toyota of Des Moines will be the title sponsor for Barnstormers Red Zone. Veteran sports broadcaster Joe Stasi will serve as host, with each show featuring Barnstormers players, coaches, weekly game reviews and previews, and highlighting Barnstormers community activities throughout central Iowa. “The Toyota of Des Moines Barnstormers Red Zone program will be a tremendous opportunity to showcase our players and personnel to not just our existing fans, but also expose even more people in central Iowa to exciting Barnstormers football,” said Barnstormers General Manager John Pettit. “Our fans will love the behind the scenes access to our players and coaches, as well as specific insight into upcoming games. Plus, our franchise could not have found two better partners than ABC-5 and Toyota of Des Moines." The Barnstormers (0-1) hit the road this Friday, for an April 16 game against the Milwaukee Iron (1-0). Iowa returns home to Wellmark Field at Wells Fargo Arena on Saturday, April 24 to play the Oklahoma City Yard Dawgz. The April 24 game will be aired live to a nationally televised audience on the NFL Network. Tickets for any individual game remain on sale at the Wells Fargo Arena Box office or by calling the Barnstormers at 515-633-2255 or visiting www.theiowabarnstormers.com.